It’s easy for this Christmas film to slip through the cracks. It isn’t as well-known as other Christmas classics such as “Miracle on 34th Street” or “White Christmas.” And many of the leads are character actors rather than superstars who star in other Christmas films like Barbara Stanwyck or Loretta Young. 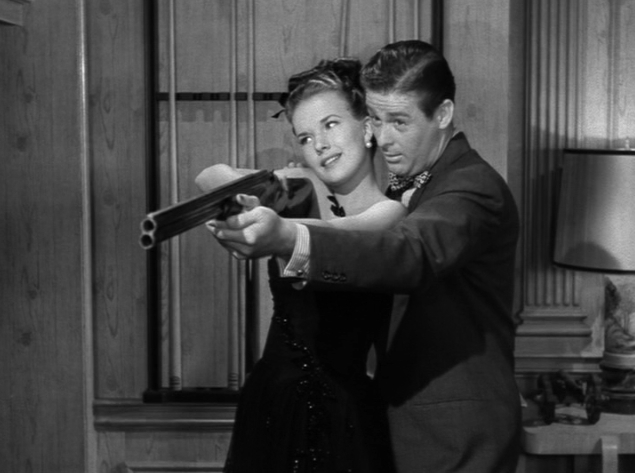 You may have never seen or heard of “It Happened on 5th Avenue (1947) but this film is far too charming for that not to be remedied- and soon. The story begins with homeless Aloysius McKeever (Victor Moore) sneaking into the wealthy mansion of Michael J. O’Connor (Charles Ruggles), the second richest man in the world. The O’Connors live in Virginia during the winter. For the past four winters, McKeever has stayed in the O’Connor home in New York from November 3 until March 13 while the family is away. McKeever eats their food, wears Mr. O’Connor’s clothes and occasionally dusts off the furniture. When the O’Connor’s come back to New York, McKeever heads to their winter home in Virginia. Homeless McKeever (Victor Moore) dressed in Michael O’Connor’s clothes as he stays in his home. With a set of keys to several mansions in New York, McKeever explains one day he got tired of working and has been house hopping for the last 20 years and never has been caught. But this winter, McKeever has company for the first time. He meets Jim Bullock (Don DeFore), a veteran who was recently evicted from his apartment. The apartments are going to be torn down by Michael O’Connor’s company to build a skyscraper. McKeever finds Jim sleeping on a park bench and invites him to his home, vaguely explaining that he is a guest of the O’Connor family. But the O’Connor house gets more crowded than just the two men. 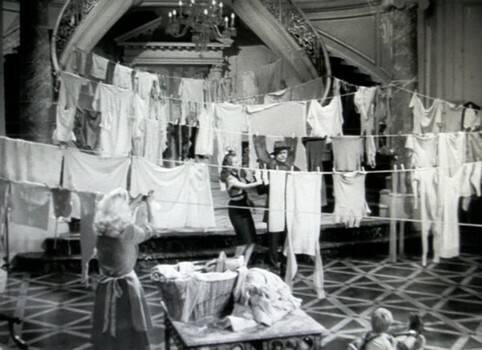 O’Connor’s daughter Trudy (Gale Storm) runs away from finishing school and goes to the house for clothes. The men think she is a thief, and she doesn’t correct them, but they let her stay. Then Jim runs into his old Army buddies (Alan Hale, Jr., Edward Ryan) with their wives and children who are living in a car. They are invited to the O’Connor mansion too until they can find a home. Wives of Jim’s Army buddies use the foyer of the O’Connor home for hanging laundry as the house gets more crowded. The kicker is when Michael J. O’Connor (Charles Ruggles) and his ex-wife, Mary (Ann Harding), stay at their home-pretending to be homeless- in search of their daughter. All the while, Jim and his Army friends are trying to bid on an Army camp for veterans who can’t find a home. Their bidding opponent is O’Connor. 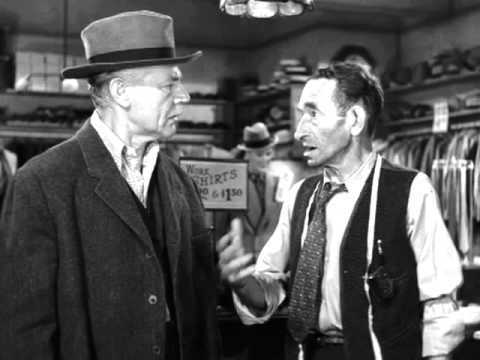 “It Happened on Fifth Avenue” was originally supposed to be a Frank Capra Liberty Film, but he chose to make “It’s a Wonderful Life” (1946) instead, according to “Have Yourself a Movie Little Christmas” by Alonso Duralde. 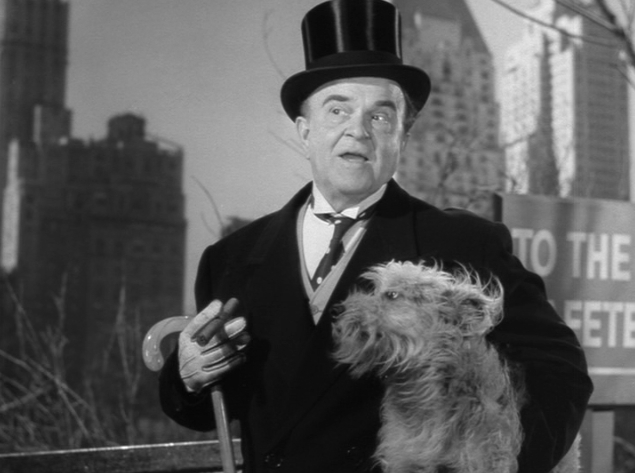 Wealthy Michael O’Connor (Charles Ruggles) exchanges his fancy clothes to dress like he is homeless. The film was originally supposed to be released during the Christmas season in 1946 but wasn’t released until Easter of 1947, Duralde wrote. It isn’t surprising that Capra considered this film. The theme of the poor creating life lessons for the rich is similar to many of his other films. “It Happened on Fifth Avenue” is funny, far-fetched and charming. It’s a comedy that makes fun of the rich, like the O’Connors, and makes the poor the heroes. The O’Connors have an opportunity to look at their lives with the help of McKeever: Michael has disregarded everything for money, Mary lives in Palm Springs and denies she’s middle-aged, and Trudy is unhappy. Money is what broke up Michael and Mary O’Connor’s marriage. It takes a homeless man to bring them back together again. Trudy finds love and happiness with Jim, the unemployed veteran. “There are richer men than I,” O’Connor says of McKeever. Amongst the life lessons and heartwarming scenes, the movie is also very funny. “He called me ‘Sugar,’ because I was hard to get”-referencing rationing during World War II. While on a mission to see every classic Christmas film I could get my hands on, I came across “It Happened on Fifth Avenue” back in 2010 when it was shown on Turner Classic Movies. Since then, it has become a family favorite in the Pickens household. This entry was posted in Holidays and tagged Christmas films, Homeless living in mansions, it happened on 5th avenue, It Happened on Fifth Avenue by Jnpickens. Bookmark the permalink. This movie is charming, even though the barely-tolerable Victor Moore is in it. It deserves more attention than it receives, and I’m happy to see you’re promoting it. “Barley-tolerable” haha! You know, as I watch that movie I think “This is one of the few Victor Moore roles I really enjoy. The movie comes across as so good-hearted and unpretentious that it is impossible not to like it,and look forward to spending time with these folks (even Victor Moore!). I love the bit with Charlie Ruggles trying to make the bed. Cracks me up no end. Thanks to a mention in your blog last year, I managed to catch this one then. Loved it and couldn’t believe I’d never heard of it before. I saw this a couple years ago on TCM…And woke up this morning to find it on….I just love this movie! Hilarious and heartwarming!